Congratulations – you’re engaged. Maybe you have been talking about your wedding for years and know every detail of how your big day will be. But if not, here are some big questions to ask yourself before you get down to the detailed planning. Why do you want to get married? 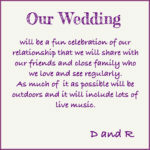 What is important to you about a wedding? Could you describe in a sentence or two why you are doing this? If you can then this can be your “mission statement” to measure your other decisions against. You may well be looking at a very different wedding if your answer is “To give our relationship legal standing and be recognised as each others’ next of kin” than if it is “To bring together all of our family and friends to celebrate the amazing life long love which we have found” or “To make a public declaration of our love, building on the traditions and culture of our families and providing a stable basis for our own children”. One couple in the USA had “Our wedding will serve as a time for our friends and family to reconnect with us, get to know one another, and enjoy a happy weekend in the Texas Hill Country.”* A “Mission Statement” by one of my couples is in the picture above. Don’t overthink this but go for a walk or curl up on the sofa and decide why you want to have a wedding so you can avoid getting caught up in too many other people’s expectations. Who needs to be there for your wedding to be the occasion you want it to be? If you just want to be legally married then it may be that just the two of you will be there with two witnesses who may be friends or just a couple of random people you persuade to help you out. You may just get married at your local Registrar’s office and let people know by posting it on Facebook. Or you may “elope” to Gretna Green or go abroad combining your wedding with a holiday. If you want a big family wedding make a note of all the people you would want to have there. It can be helpful to have 3 categories – maybe, must have, love to have, happy to have if we have room. (Think about friends of your parents or children – are there any people you need to consider even if they don’t make the final cut?) Think about friends who you are both close to who you want to celebrate with you and others who one of you may know or the people you work with. 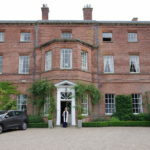 You may want to think about who you want to invite to be a part of your wedding such as Best Man or Bridesmaids – you may want to ask longstanding close friends at an early stage but you don’t need to do this straight away. You may find it easier to identify who shares your excitement once you have had a few conversations about the wedding, especially if the wedding is a couple of years away. Now you have ideas of your why and who you want to be there you will have a clearer idea of what you want to plan. Is it going to be a very private affair where you go off to somewhere like Gretna Green or Las Vegas or a beautiful deserted seashore or in your own garden? Is it going to be a traditional wedding which will include cultural or religious elements? Is it going to be a small personal ceremony with close family and friends followed by a meal with lots of chat? Is it going to be a festival style celebration with tipis and bands and camping? Is it going to have some elements of tradition but with your own personal twists? 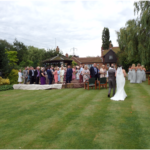 Do you want the ceremony and the reception/party to be in the same place? A good way to think about what you want is for each of you to write down 3 things that you would really like to have as part of your wedding. Then show these to each other and try to get a top three that you both agree on. When we got married my husband’s big ask was that we have live music with a band so we made sure that happened. Another element to include here is what kind of budget will you be looking at and whether you will be paying for it all yourselves or can expect some help from family. Remember that when others are contributions they may want a say in what kind of wedding you have and what you spend their money on! 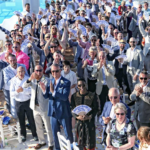 Now you have some ideas about who you would like to celebrate with you and what things you want to include, you can start to think about where you want to hold your wedding. 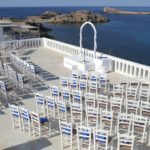 If you are going to get married in another country you need to find out if there are any legal restrictions and you may want to get a travel agent or a destination wedding planner to help you. If you want to get married nearer home you should consider what is important to you. Do you have a dream of a fairy tale castle or of a Glastonbury style vibe. If you have elderly people attending or those with disabilities or children – are there things you need to take into account? Are there any unusual places near you that host events such as art galleries or museums but aren’t licensed for weddings? If you still want to have your Ceremony there you can do the legal bits with a Registrar or a Minister of Religion and then have a Celebrant to take your Ceremony anywhere. (Including licensed premises). Your numbers will affect what is possible for your venue as will your budget. 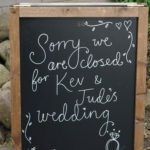 So will the availability of your venue so it is good to ring and ask how far in advance they are booked. And in turn this will affect the next question – when? You may want to enjoy being engaged and just save a little before setting a date. People will ask you when you are thinking of so have an answer you both agree on even if it is “not for at least three years”. Factors like budget and how determined you are to have particular things as part of your wedding can affect when your wedding will be. But you may also have an elderly grandparent who you would love to have there and so not want to leave the wedding too long. 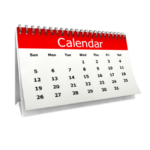 Popular venues and suppliers often get booked up well in advance so that can also affect decisions about dates. You may have a special date that you would love to get married on. Or you may have other circumstances that will influence your decision. Weddings are often on a Saturday as fewer people work on Saturdays and they also get Sunday to recover and/or travel. However it can make a big difference to your budget to go for a weekday. If you are considering that you need to recognise that if you have teachers in the family or school age children you want to involve, you may want to look at school holidays. Sundays can be good, especially in front of a Bank Holiday Monday. Your venue of choice may have limitations. If you want your wedding ceremony to be outside it is best to avoid the winter months (although a plan B is always helpful for the weather any time of the year in the UK. This list isn’t exhaustive of course but gives you a good base for questions to ask yourself. Once you know the answers to these you are well on your way to planning your wedding. Enjoy! 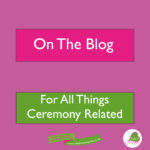 For more advice on all things wedding ceremony see The Blog.